There are a few power units I’ve been using, testing, and documenting over the last many months. It’s easy to get 5V 2.4A charging, and Qualcomm Quick Charge standards (or Anker’s analogue to them) are pretty easy too. But there’s a somewhat new charging consideration that’s lighting up even more this year, with a possible catch. When Apple released the iPad Pro (12.9″ 1st generation) in 2015, it was an amazing media consumption and even creation device. Support for the new Apple Pencil for creative types, a huge beautiful screen, and a huge 10Ah 38Whr battery… what’s not to like? How about charging that huge battery? Soon, though, Apple released a USB-C to Lightning cable, which would allow you to charge at about 28 watts (that’s 2.3x as fast on a good day). This cable also opened the door to directly connecting to the new USB-C Macbooks, and with the 30W or better Apple chargers, you could get that 28 watt charge going. Most USB Power Delivery chargers and battery packs at 29 watts or higher can also rapid charge your iPad Pro. When the iPhone 8 generation came out, Apple started supporting a rapid charge at 18 watts for those devices, and newer iPad non-Pro models (in the last year) have also taken on the faster charge rates. The catch was, Apple did not sell or license their USB-C rapid charge chips for third party manufacturers. So while some overseas companies made USB-C to Lightning cables, they couldn’t charge faster than the standard USB-A cable, and wouldn’t be MFI-certified. So $19-35 went to Apple for each of those cables, and you got your rapid charging. You also got typical Apple cable sturdiness (such as it is), which left many people replacing cables and grumbling. Now that Apple is moving to USB-C for charging their devices, they’re also allowing third party USB-C to Lightning cables by licensing the C89 and similar connectors/chips. Anker announced one last month at CES, pre-orderable now on their website and shipping later this month, and a crowdfunding project from a company called Cascade Cables is also promising such a cable coming in April. 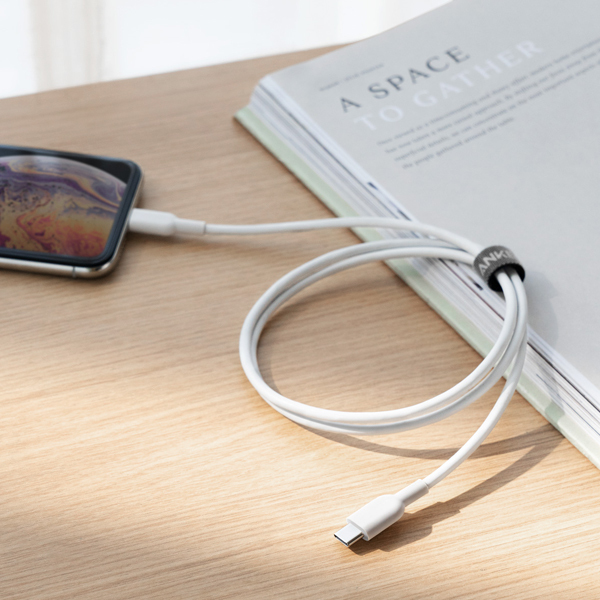 These new cables are sturdier, potentially more aesthetically pleasing, and the Anker cable is priced lower than the Apple version by a couple of bucks. Now the question is whether these cables will support the full range of charging rates that those of us with larger devices will need. Anker responded to an inquiry on Facebook about the iPad Pro charge rate by telling me that my iPad had USB-C and I could use USB-C to USB-C cabling. Alas, the 2015 iPad Pro doesn’t have USB-C, and they didn’t follow up on the question. However, their pre-order page says it uses USB Power Delivery, which has me feeling optimistic. I’ve inquired with Cascade Cables as to whether they’ve tested with 28W devices. I’ll update this post if I hear back from them. With the higher power cabling, whether from Apple or a third party, you’ll need a USB-C Power Delivery charger to negotiate the higher power level. The easy option is to pick up an Apple USB-C Macbook charger. If you already have one for your Macbook, you can use it to rapid-charge your iOS devices as well. And note that if you have another USB-C charged laptop (like a Dell XPS 13 or XPS 15, a newer Lenovo, and so forth), you can use the Apple chargers as long as they feed enough wattage to charge your device. For the third party side, I’ve had very good experiences with Anker, so it’s worth considering a charger from them that provides at least 29 watts on USB-C, like the Powerport II ($30) or Powerport Speed+ Duo ($26). The Powerport II offers up to 19.5 watts on USB-A, which is good for quick-charge devices or iPhone 8 or later; the Speed+ Duo is limited to 12 watts on USB-A. If you’re patient, Anker has also announced their entry into the GaN (gallium nitride) charging field, the Powerport Atom PD1 charger which gives 30 watts of juice in a tiny form factor. It’s listed on their website for pre-order on Amazon, but Amazon is currently offering email alerts for when it’s available to order. I’ll update when that comes out of unobtanium as well. I have the RavPower 45W GaN charger in house, and will be writing that up soon too. And if you want to see what power profile your charger is negotiating, regardless of which charger or cable you use, I’ve used the Plugable ($20) and Satechi ($30, right) USB-C power meters with good results. You don’t need a power meter to just charge your devices, but it can be useful to troubleshoot slow charging, flaky cables, or power profile mismatches (like the ones we’ve experienced with the Dell XPS 13 9370). As the newer cables come out, I’ll be acquiring and testing them. Same goes for the new PD1 charger from Anker. With an iPhone 8 Plus, a 2017 iPad Pro 10.5, and a 2015 iPad Pro 12.9 in the house, rapid charging is an important topic. I’ll also have some updated coverage on battery packs to rapid charge your iOS devices, and even charge your USB-C Power Delivery laptops. The new HyperJuice “World’s Most Powerful USB-C Battery Pack” and Omni Ultimate battery packs are in house and ready to test, when work lets up a bit. What are your charging concerns, and what interesting solutions have you found to keep your devices up and running? Share in the comments, or ask any questions you may have. As always, if you buy through our links above, we get a small commission, which then goes back into buying more stuff to review here and on rsts11travel. We appreciate your support. I recently bought the Monoprice 33467 wall charger, and got a question about charging wattage on the site a little while afterward. Since Monoprice does not provide specific rates for the ports on this device, other than 60 watts on USB-C (standard for USB Power Delivery chargers) and 80 watts total, I decided to get out some thirsty high-draw devices and USB power meters to see what the rates would be. This device has a removable two-pin power cable, a USB-C port, and four USB-A ports. The USB-C port is rated for up to 60 watts with USB-PD, and the total adapter is rated for 80W. Update: The vendor confirms 2.4A per USB-A port, with full capacity available across all four ports simultaneously. See end of post for more. It gets a bit warm when you load it up, so I wouldn’t put it on a container of ice cream or on bare skin, but it’s not too hot for an 80 watt device. These are bidirectional-capable testers that show voltage, amperage, milliamps of current, and direction of power. I believe these are identical devices, either licensed or flattered by one or the other vendor. I bought the Satechi almost two years ago, and wrote about it here); the Plugable came out afterward, I believe. Satechi told me some time ago that they should handle 300W of power, and I’ve used theirs with the 130W proprietary Dell Thunderbolt 3 Docking Station charging option for the XPS 15 9550 laptops, without releasing any smoke. The bidirectional feature is interesting, in that you can use some USB-C mobile phones to charge other devices, and this will tell you which way the power is going. It’s also conceivable that you could charge a USB-C power bank with your laptop, as opposed to the other way around. This is a formidable device in that it supports USB-A, USB-C, and Micro-USB input, with USB-A and USB-C output based on the input source. It’s rated for up to 30V/5.1A which should cover any USB-C charging I’ve seen. It is large and not friendly to being plugged in next to another cable, as you can see from the picture, but it’s very convenient (even showing four wire voltage and three different English interfaces/displays as well as Chinese). It is not bidirectional, so you’ll plug the metal plug into the power source and your charging cable into the jack. PortaPow is a UK company that came to my knowledge for their charge-only / data blocker cables. These cables block/bridge the data lines in a USB charging cable, letting you charge (potentially) faster while keeping a host or charging device from spuriously accessing the data on your device. Their power meters offer similar functionality along with a backlit LED power display. The pictured/linked one is their third version; I’ve used the first two versions successfully, although the older ones do not to my knowledge support higher than 5V charging. All targets were chosen for capability to charge at higher than 10W rates, as well as being under half charge so that full charging rate would be realized. The Pixel 2 XL charged at 12 watts (9.33 volts) with a USB-C cable. With a USB-A to USB-C cable, I got closer to 5 watts, although the cable might be to blame. The iPad Pro charged at about 12 watts (5.12 volts) with a USB-A to Lightning cable, and about 28 watts with the USB-C to Lightning cable. The iPhone 8 Plus charged at about 18 watts (9.37 volts) with USB-C to Lightning, but only 8 watts with USB-A to Lightning. The Anker battery pack charged at about 17 watts (9.34 volts) which is fair for the Quick Charge 2.0 level of input (the newer version of the pack supports QC 3.0, and the Power Delivery version of course supports USB Power Delivery at up to 27 watts input). The XPS 13 9370 negotiated to 30 watts of input (at 20V profile) while powered down. The XPS 15 9550 negotiated to 45 watts of input (also at 20V profile) while powered down. This would have reported a BIOS adapter error if I had booted up while connected, as would the Pixel C 60 watt charger, but it will still charge. In short, if you need to charge several devices at a time, but don’t want 4-5 chargers, the Monoprice 80 watt charger is probably a good choice. If you have a more power-hungry device, like a large MacBook Pro or a heavy USB-C battery pack, you may still want to keep an 87 watt charger around for it, but for modest / travel use, the power this device offers should be good enough to keep you going. I will probably plug the charger itself into an AC power meter, and see how it handles multiple inputs (including the laptops) in parallel. My expectation is that USB-C would take priority, so with 45W going to USB PD, I could use up to 35W max on the USB-A ports. I did have the iPad, Pixel XL, and Anker battery plugged in at the same time and they seemed to have similar charge rates to each one individually connected. Have you had experience with the Monoprice charger, or have any test conditions you wonder about? Share in the comments, and I’ll check them out if I can. Update: A Monoprice product specialist responded to my inquiry this morning (11/9/2018). They said that the charger “can supply at least 2.4 amps each port and all four can supply this current simultaneously. The total wattage of 48 Watts across all USB-A ports.” Based on this reading, if you are pulling 12 watts per port, you should be able to drive 32 watts of USB-C which should cover an XPS 13 or smaller, a battery pack, or the newer Apple devices with rapid charging. My friend John Obeto pointed out some pre-release coverage of Satechi’s new USB-C power meter a week or so ago. I’ve had a number of different USB-A (standard port) testers and meters for a while, but with more devices coming into rsts11 headquarters with Type C connections (including the XPS 13 9350 and XPS 15 9550, Apple’s 12″ Macbook, the ASUS Zenpad Z10 from Verizon, and the Nexus 6P by Huawei and Google), I’ve wanted to look at power consumption beyond what an A-to-C adapter could reveal. For those of you new to USB-C, it’s designed (in part) to be a universal connector for power and data, incorporating high speed data in a connector shared with Thunderbolt 3 (40gbit capability), a reversible connector like Apple Lightning, and some daisy-chaining capabilities like Thunderbolt 2. The standard allows for up to 100W of power, although the highest powered adapters I’ve found are 60W. The Dell Thunderbolt 3 docking station has a non-standard option beyond this; when you’re connected to a recognized Dell device it will bump the power up to 130W just like the stock XPS 15 adapter. I’m a 22 year veteran of Silicon Valley/Bay Area system administration, now retired from doing Real Work(tm). I’ve done networks, storage, IT, operations, caffeine procurement, and just about anything else that plugs in or acts like it. I’ve worked in 149-person and 149,000-person companies. Today I work for Cisco designing solutions and telling stories around big data and analytics. See the links above for disclosures and caveats to my coverage here. My thoughts here are my own, and should not be taken to represent any company or entity other than me.